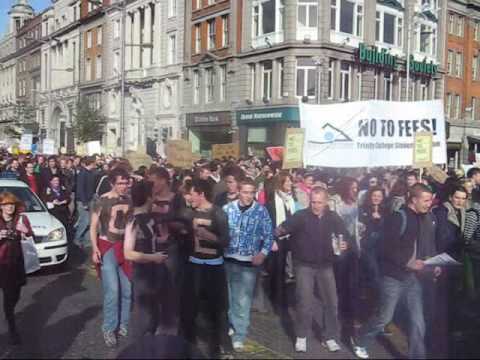 Between ten and twelve thousand people turned out in bright sunshine today to demonstrate against the Green Party/Fainna Fáil plan to impose fees for third level education. FF Education Minister Batt O'Keeffe called for consideration of re-imposition of fees earlier this year, and "registration fees" were massively increased in the recent budget. He has signalled that he intends to introduce legislation on third level fees in the new year. 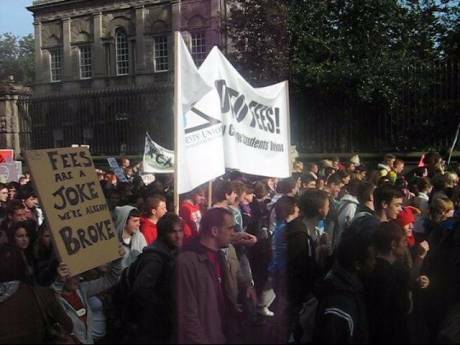 Protesters at the march in Dublin were mainly students, but they were joined by secondary school pupils, teachers, and activists from leftwing political parties, notably Labour and Sinn Féin. 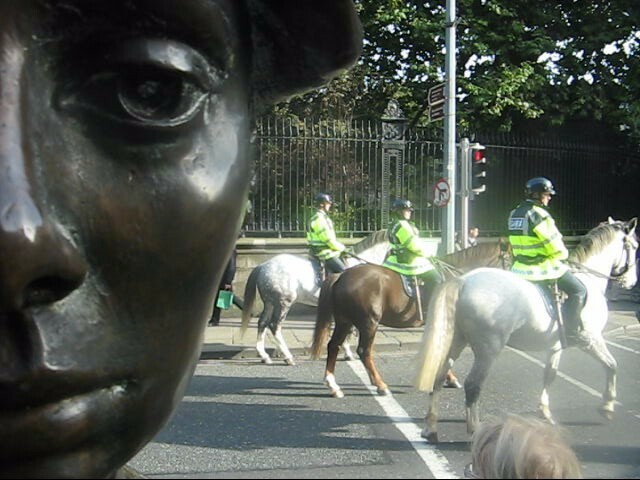 The size of the crowd seemed to to surprise the gardaí, who deployed the horse unit and dog handlers to patrol the march. It's the first time the garda mounted police have been used in a protest setting, according to some of the veteran marchers present. The march was peaceful and good humoured, although the gardaí seemed to become jumpy when a section of the crowd started chanting "Shell to Sea!". 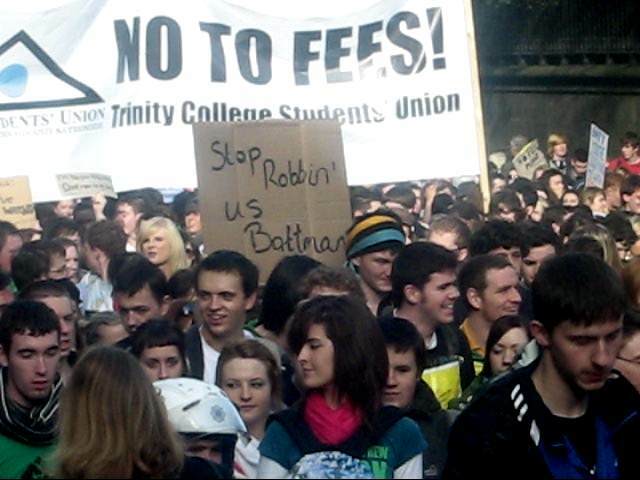 Education Minister Batt O'Keeffe has made no statement in response to the march. He is currently in China. Perhaps he is asking the Chinese government for tips on handling student demonstrations? 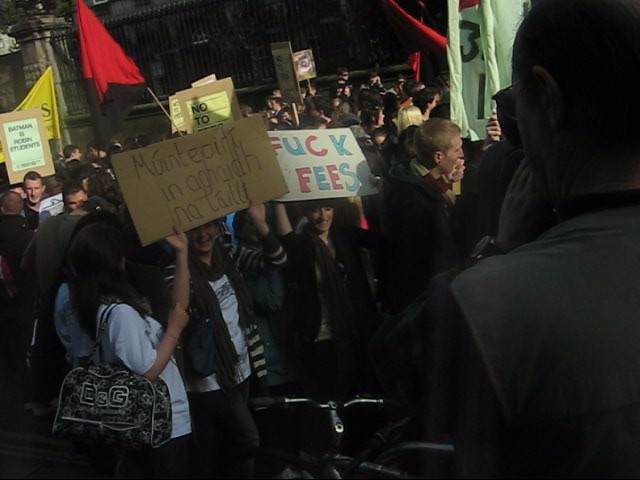 Updates on Student anti-fees protest this afternoon (Wed 22nd Oct). RTE Aertel are reporting up to 10,000 at the protest outside Leinster House and it says about 80 gardai are guarding the main gates of Leinster House on Kildare Street. Activists from many countries around the world are staging simultaneous protests against the commercialism of education (including the paying of fees for third level education) on Nov. 5th. 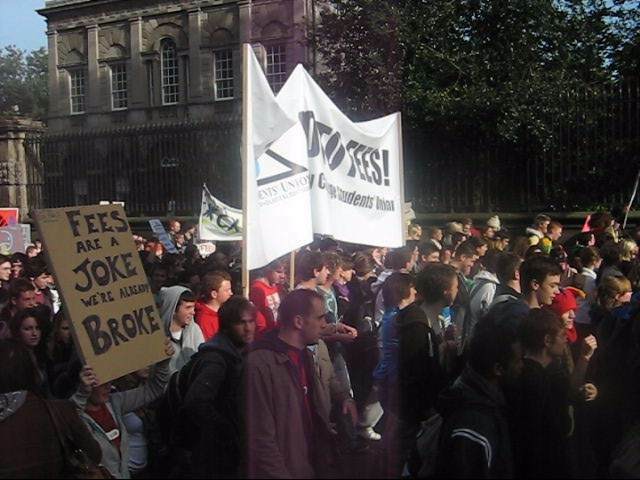 I think the WSM might be holding an event in Ireland to mark it; certainly FEE (Free Education for Everyone - UCD) have mentioned that they will try to hold an event. I would be great if other groups did likewise. * On Oct.22nd (Wednesday) students in Ottawa will go to the Premier's office with a petition against top-up fees containing 20,000 signatures. The group is keen to receive greetings of solidarity via phone (11.15am local time). A few hundred students are expexted. So far they will receive a call from Germany. If any other groups are willing and able to do so, then please contact Iain: iain-b@hotmail.com --- The Canadians are also willing to call you back, if you give them a ring on Oct.22nd. Since that will be cheaper. Will Canada call Greece? Maybe just one or two more calls would be great. The majority of "live solidarity greetings" will take place on Nov.5th itself. * Strikes (also by students) are planned on Oct.23rd in Colombia. Anybody willing to deliver greetings of solidarity on that day? Colombia will receive one call from Germany. Anybody else willing and able to call? And ask them to join activists around the world on Nov.5th as part of the call? Calls are welcome from 9am (local time) onwards. * You are all asked to put a local event notice on your local indymedia site. See: indymedia.org (scroll down and on the left sidebar search for your local indymedia) --- Activists in Germany are planning to write a feature on Indymedia Germany on Nov.5th. Indymedia.ie will also have a feature especially written for the day. Really great to see so many young people making their voices heard!! 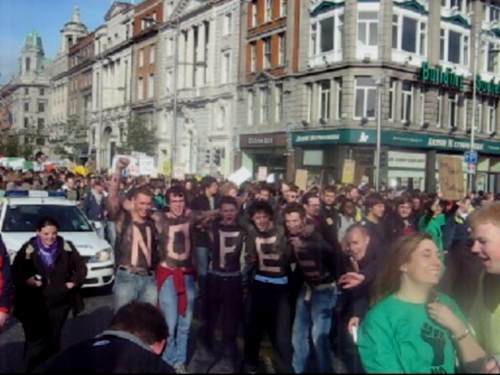 I see in one of the pictures there are five lads with black body paint spelling out NO FEE. What happened to the S? Was there someone wandering around alone with just an S on his chest, looking for his mates and trying to explain to people what he was up to?